It wasn’t until Link’s Awakening that the Zelda titles started having a proper plot. A Link to the Past had a bit of a story, but a story running throughout the whole game really started with Link’s Awakening. That must mean Koizumi-san the romantic, who was in charge of the story, had quite a large influence over the general direction of the Zelda series. Link’s Awakening, which Tezuka-san did whatever he wanted with, had quite an influence over subsequent Zelda games. As far as the general flow goes, I think so. Whoa, here we go. (laughs) Iwata-san, do you know about Twin Peaks? We were talking about this before you arrived. I was talking about fashioning Link’s Awakening with a feel that was somewhat like Twin Peaks. At the time, Twin Peaks was rather popular. The drama was all about a small number of characters in a small town. So when it came to Link’s Awakening, I wanted to make something that, while it would be small enough in scope to easily understand, it would have deep and distinctive characteristics. That makes me think of Wuhu Island in Wii Sports Resort11. The events occur at a well-known location, so background elements come into clarity. You were thinking about that for Link’s Awakening? 11Wuhu Island: The island that is the setting of Wii Sports Resort and Wii Fit Plus. The general concept is to develop a wide variety of games entailing adventures and other activities that take place on the island. For more on the “Island Concept,” see Iwata Asks: Wii Sports Resort. You thought he just wanted to be trendy? After that, in Ocarina of Time 12 and Majora’s Mask 13, all kinds of suspicious characters appeared. I didn’t tell them to do it that way, but personally, I did find it considerably appealing. 12The Legend of Zelda: Ocarina of Time: The first 3D Legend of Zelda title. Released in Europe for the Nintendo 64 in December 1998. 13The Legend of Zelda: Majora’s Mask: Released in Europe for the Nintendo 64 in November 2000. The staff who worked on Ocarina of Time had all played Link’s Awakening, so they had a sense of how far they could go with the Zelda series. That makes sense. Tezuka-san, you broadened what was permissible for Zelda without even realising it. I guess I did. Well, I’m glad I could contribute. I’m certain it was a breakthrough element in the series. If we had proceeded from A Link to the Past straight to Ocarina of Time without Link’s Awakening in between, Ocarina would have been different. Yes, I agree. It made a big difference that the staff knew the possibilities. Tezuka-san, you worked on handheld Zelda titles after that, too, didn’t you? Yes. That was together with Capcom. 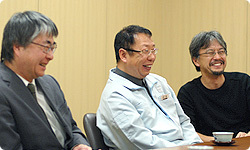 At that time, Yoshiki Okamoto14 was at Capcom, and he wanted to make a Zelda game. The plan was to create a remake of the first The Legend of Zelda. I thought if it was just going to be an adaptation of the first one then it should be alright. Then, while we were talking about it, I realised he had quite a strong affection for the Zelda games. Normally, though, I would have been resistant to leaving games like Zelda or Mario to anyone else. 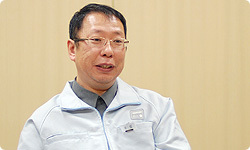 14Yoshiki Okamoto: A game creator who helped develop the Street Fighter series, among other titles, while at Capcom. Currently he is president of Game Republic Inc. I vividly remember being shocked when I heard that. I almost thought it must be some kind of mistake. Not because of Capcom, but because I thought Zelda was a prominent title that Nintendo kept very close. I just assumed that it would be impossible for a major Mario or Zelda game to be made by external entities. Usually, that would be true, but Capcom works really fast, and talking to them, I could sense their enthusiasm for the series, so I thought we could trust them with it. We had them make Oracle of Seasons and Oracle of Ages 15. 15The Legend of Zelda: Oracle of Seasons and Oracle of Ages: Two action-adventure games released simultaneously in Europe for Game Boy Color in October 2001. But you were checking in on it rather frequently. Yes. Capcom is in Osaka. Since they were so close, I visited them on numerous occasions. We hadn’t dealt with them in the past, and I found the temperament with which they develop a game is different from ours. They struck me as being real sporty types. (laughs) Not at all like us. What type were you Nintendo guys? A circle of like-minded people. So it was the Afterschool Club of Like Minds versus the Strictly Hierarchical Athletic Types, and it was that unusual combination that brought forth Zelda for Game Boy Color. The first one went really well, so I thought I could leave more to them. That led to the later Zelda games for the Nintendo DS.